221 in stock Need More ? 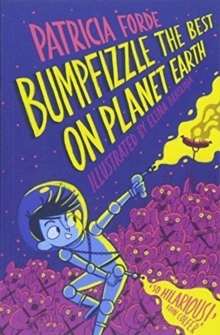 Bumpfizzle is an alien, sent to Earth from Planet Plonk on a research mission. Or is he really just a ten-year-old boy who is feeling a bit disgruntled at all the attention his parents are lavishing on The Baby? It is up to readers to make up their own minds. Either way, Bumpfizzle's confusion at Earthling behaviours, as reported in his diary and his frequent reports back to Plonk, are hilarious, and his adventures are ridiculous, from eating the cat's food (it makes him throw up, always good for attention) to biting his teacher (to check if humans would make a good source of food for Plonkers) and attempting to sacrifice a goat (he soon discovers what goats' horns are for).